The world is more empty than open in the most disappointing Warriors game I've ever played. Well, here we are. 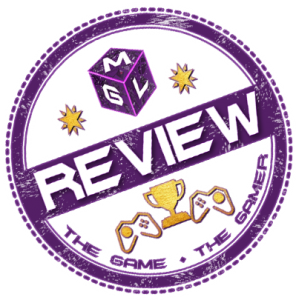 It’s the Dynasty Warriors 9 review. From your resident Musou game “expert”, a term we use lightly for somebody that loves something a lot. The action game series from Omega Force that pits one legendary warrior against thousands of others was poised to take a step further on the next generation of consoles. My PlayStation 4 was primed and ready. Koei Tecmo and the games they publish are hit and miss for me, but a main-line Dynasty Warriors game? A brand new, numbered entry in the mass-PVE power trip simulator? Nothing could go wrong. Not for a huge fan of the Musou genre. But it could, it did and it continues to do so. 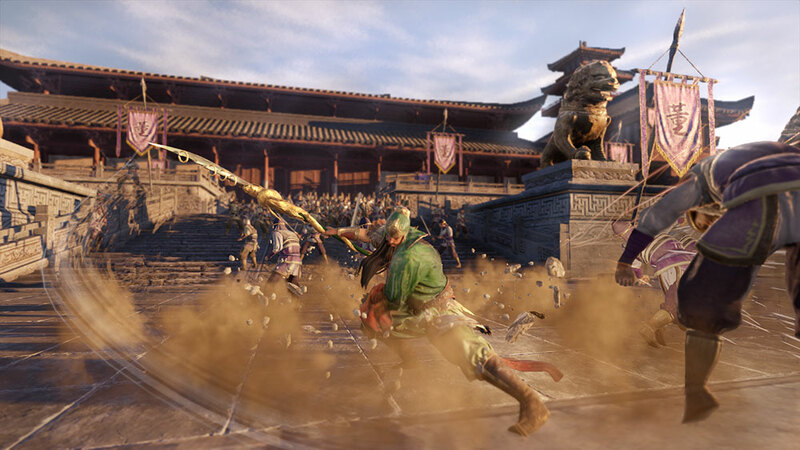 Dynasty Warriors 9 is a technical mess, a disaster of an English localisation and an abandonment of much of what made Dynasty Warriors 8 (and Xtreme Legends) a fantastic entry in the series. From an epic high to a shocking low. That’s the gist of how I feel. What little merit there is to give Dynasty Warriors 9 is ravaged by all that makes it terribly disappointing. With that said, read on for my full thoughts (and what tiny aspects of it I managed to enjoy). What is your ideal Warriors game, and how would you like it to be designed? 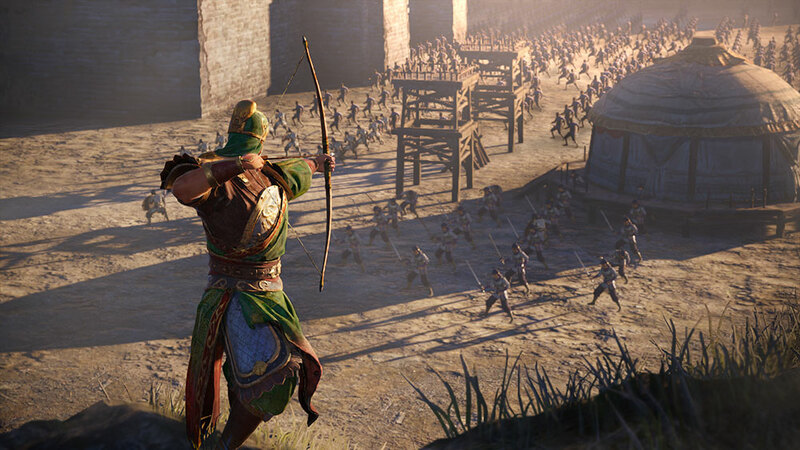 Dynasty Warriors 9 places the player, as it always has, in the shoes of a legendary figure from early China’s Yellow Turban Rebellion through to the country’s unification. In this case, players are forced to play through Cao Cao’s campaign first – originally a lord who would go on to found the Wei Kingdom and establish the foundation for a united China. Each chapter of a character’s story takes place on an open world that players are free to explore. By completing missions, most of which are listed on the main menu screen, the “Main” goal’s level will be reduced, making it easier to complete. Sadly, this is why Dynasty Warriors 9 begins to go down-hill. Though, in theory, the open world idea is intriguing, Omega Force’s execution of the concept leaves much to be desired. Thus, we hit upon Dynasty Warriors 9’s greatest flaw: a bunch of interesting ideas implemented terribly at the cost of its predecessor’s identity. By chasing the open world, with missions upon missions of meaningless fodder, Omega Force abandons the climactic moments. Zhang Jiao’s Yellow Turban Rebellion goes out with a whimper. Dong Zhou is killed by Lu Bu as if it’s no big deal. Zhang Fei’s legendary stand at Chang Ban bridge has a little more effort put in, but the game hard-crashed on me when I finished the fight. For the most part, Dynasty Warriors 9 feels lifeless. There’s a single moment that shows the promise of what Dynasty Warriors 9 could have been. 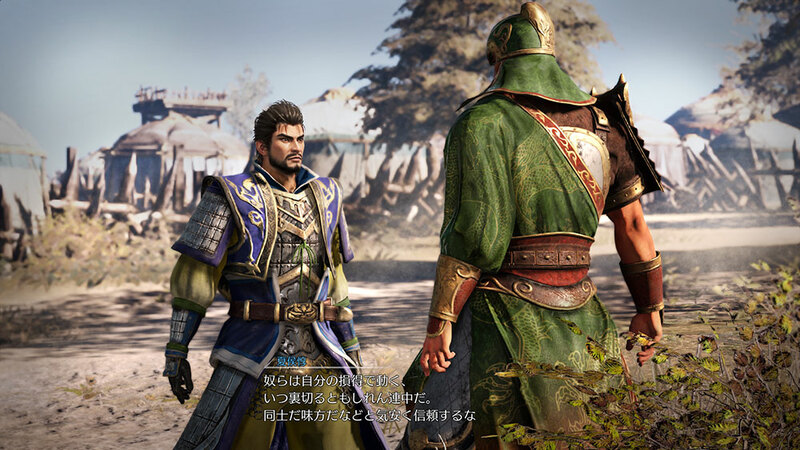 In Cao Cao’s campaign, he invites Liu Bei for a talk long before Liu Bei becomes a threat to Cao Cao. Their quiet conversation over tea against a stormy backdrop is handled with care, but it’s one of the few moments I’m ever likely to see. Because enduring the bland, open world tedium for each and every character – even for a single important character per Kingdom – is unfathomable to me. In its action gameplay, franchise fans will find a few modifications have been made to the usual control scheme. No longer will mashing square (on Playstation 4) yield satisfying results. Nor will a follow-up triangle combination enact a strong special attack. Instead, holding R1 for one of four styles of attack can be followed up with a combination move – a “Flow Attack” that can be chained in to another special move. It sounds intriguing but, in practice, it makes every character feel the same. Having dabbled with a few characters after finishing Cao Cao’s campaign and unlocking “Free Mode”, there’s little difference between each playable officer. And there are ninety of them. F***ing ninety. Short of their impressive character models, there’s nothing to see. No reason to experiment. It’d be easy to dismiss that criticism as nonsensical. Warriors games are always the same, right? But there’s a reason people settle on a favourite character in Warriors games. There are whole threads dedicated to Lianshi’s awesome crossbow in the past games. I loved Zhou Tai and Xu Shu for their wide-range multiple slash attacks. And now, they’re all but gone. If not gone, far less effective in this new, “open” world they’ve established. But if You’re In to That…. Then I respect that. What there is to do in the game is as repetitive as it ever was, but now on a much more massive scale with far less visual flair in-between. I’ll expand upon that later, but if you’re enjoying it, there’s plenty to do. Even if it is a bit shallow. Characters level up through completing the various missions made available to them, most of which can be fast-travelled to, or at least nearby. When characters level up, they have upgrade points that can be placed in one of various slots affecting strength, defence, agility and so on. The real increase in ability, however, comes from equipment. Four accessories can be equipped at one time, granted huge boosts to stats or bonuses to movement skills like the air dash. These items can be purchased at stores, crafted or – for the extremely rare and powerful items – traded in against one of five types of collectables, granted as mission completion rewards along with money and experience. Horses level up with use and can be sold at a higher price, as well as legendary horses becoming purchasable through certain achievements. Weapons can also be purchased and each has six gem slots, assigned to the various abilities a character has. It’s a fine system on paper, but it falls apart when you go out to do the missions and it’s very flat, dragged-out and lacking in any kind of fun. 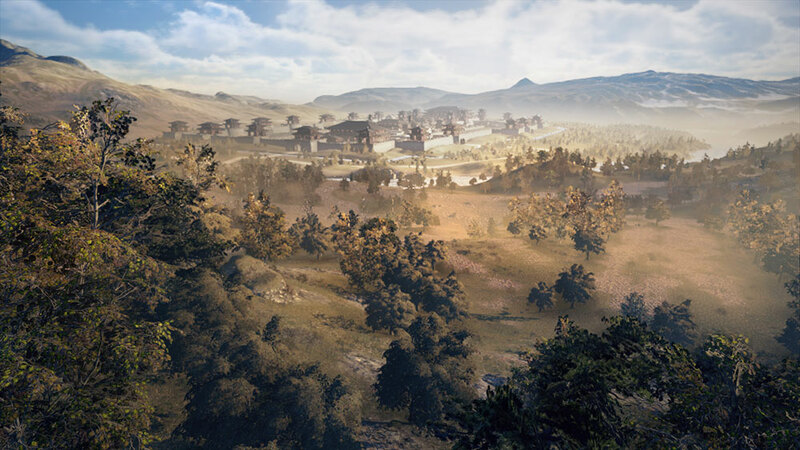 Presentation and Graphics is how we title this section, and no game has been more fitting of the divide than Dynasty Warriors 9. On the one hand, the character models are very well done. Their clothing is elegant and the characters themselves rarely feel like visual palette swaps. So much design work clearly went in their forms and clothes. So it’s a shame when the ambitious characters are presented in glorified dioramas. Against lack-lustre backdrops. Areas that make you say “China sure was very brown nearly 2,000 years ago”. Historical accuracy doesn’t always work to the advantage of a game where Cao Cao literally freezes his enemies with magical hailstorms. The few well-presented scenes there are get drowned out by the dull outposts and consistently weak character interactions. As mentioned before, only select scenes like Liu Bei and Cao Cao’s tea exchange get the real treatment. Dynasty Warriors 9 offers three options for the vocal tracks in the game: Japanese, English or Chinese. The Japanese fits very closely to the lip movements of the characters. The Chinese sounds the most authentic in a game based in China. The English, however, is another story entirely. Because Dynasty Warriors 9 has a lot going on at once on-screen, it’s best not to have to read a lot. This has been the trouble with games that aren’t mainline Dynasty Warriors: they rarely get an English localisation, then try to feed your important information in text boxes that disappear all too quickly, spoken in a language most people don’t understand. For the first time outside of a Star Ocean game, I wish they hadn’t bothered. The English voices they used to use (one might assume this was localised during the SAG-AFTRA Strike) had a lovable cheese to them. They are over the top, grandiose and – for as silly as they are- filled with passion. Dynasty Warriors 9 has none of that. The English voice actors this time around are atrocious. It sounds as if they barely received any direction. Mispronunciations, over-pronunciations, dead-pan tones and silly for the sake of silly at times. There is nothing to enjoy about their performances. Above all else, Xiahou Dun and Lu Bu hit me the hardest. Xiahou Dun’s voice actor seems like he’s stuck in a loop of eternal sarcasm, even in his seemingly sincere moments. Lu Bu sounds like an awkward-but-cocky English aristocrat. The man that’s supposed to strike fear in to the hearts of people sounds as if he made you a batch weak tea and doesn’t care about that fact. As if that wasn’t enough, the menus are as basic as it gets. Outside of the Zhao Yun Mega-Zord being formed in the opening (here’s the link), the game’s presentation seems to have been put on the back-burner. At least it’s all readable. Unless you’d like to read the subtitles during cut-scenes. Then you might need to get closer to the television. Or listen to the English dub. The former being the much better option. But it’s just so bland and uninteresting. Basic fonts, white text with a slight black outline. They could have made your equipment load-out an Excel spreadsheet and you could barely tell the difference. When it does try and do something interesting, something else goes wrong. The frame-rate in rain-storms amidst hordes of enemies is a chore to chug through. Few and far between, granted, but my reaction went from “Oh! Heavy rain and fog, interesting” to “Just move. MOVE!”. Much quicker than I’d like that to have happened. 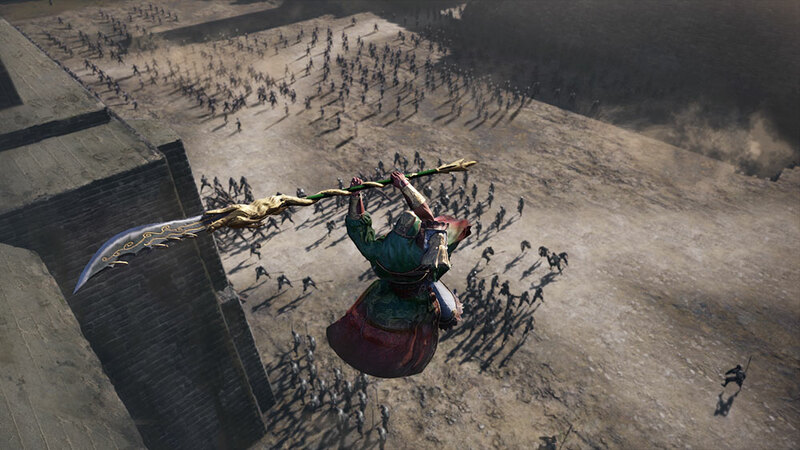 Dynasty Warriors 9 features a main campaign mode, allowing for unlockable characters as you progress with Cao Cao initially. The campaigns are fairly lengthy, split in to several chapters, and can be tackled either by lowering the main quest difficulty by completing side missions, or heading straight for the main camp for a tougher challenge. After the first campaign completion, Free Mode is unlocked. Players can choose any character they like to undertake campaign chapters they’ve completed before. The character will then appear during conversations they shouldn’t be a part of. Imagine being Lu Bu as Cao Cao talks about slaying Lu Bu. One of the few weird moments of joy. Everybody in this game gets a grappling hook. This can be used to scale any tall wall, building, outpost etc. Now, if this were a much better game, I’d be disappointed. There are Siege Battles around the map that could have been incredibly interesting ways of infiltrating a main base before delivering the finishing blow to your enemy. But the game isn’t fun. The effort is rarely worth it. So being able to grapple hook up the walk, air dash to your enemy and kill them immediately with two moves is welcome. A sorry state of affairs, but it’d be a much worse game without the grappling hook, given the sad state that it’s in. Should I play Dynasty Warriors 9? It pains me to say no. I want to recommend Dynasty Warriors 9. I do think there’s some merit in at least trying it, but £19.99 on Dynasty Warriors 8 Xtreme Legends Complete Edition might be money better spent. The English dub is a mess and the story is told poorly; missing context half of the time from its few good cut-scenes. The action isn’t as engaging as it once was in the new, stream-lined style. Almost every character feels exactly the same as the last, with very few exceptions as I continue to comb the roster of ninety. NINETY. It’s not that they’re clones but that the system doesn’t offer any sort of variety, with the removal of the more interesting, fantastical weapons. Hell; most of what they replaced wasn’t even fantastical. Lianshi had a crossbow. Why give here curved blades now? It’s utterly bizarre. I can’t imagine the type of person that should try Dynasty Warriors 9. It abandons enough of the Musou formula to alienate fans of the series without being appealing enough of a change for newcomers. Perhaps, curious Warriors game fans who’ve grown tired of the traditional formula. Even I’m trying to like it, but it keeps pushing me away. I sincerely hope you have better luck. Dynasty Warriors fans. People that aren’t Dynasty Warriors fans. Everybody in-between. Play the better games. Maybe the issues will be fixed in the inevitable Dynasty Warriors 9 Xtreme Legends entry a year from now. Assassin’s Creed if it didn’t have much interesting to look at. Dynasty Warriors if it stopped being Dynasty Warriors. Samurai Warriors if it were set in China… wait…. never-mind. Shared items between characters, meaning using other characters with powerful items is a breeze after one completion. Utterly disgraceful English localisation. Hard crashes before and after certain scenes. Legendary Horses are cool Grappling Hook invalidates a lot of the game mechanics. Character designs are great More than I can list here.